Shivaji Maharaj built Padmagad, Rajkot and Sarjekot to protect Sindhudurga. 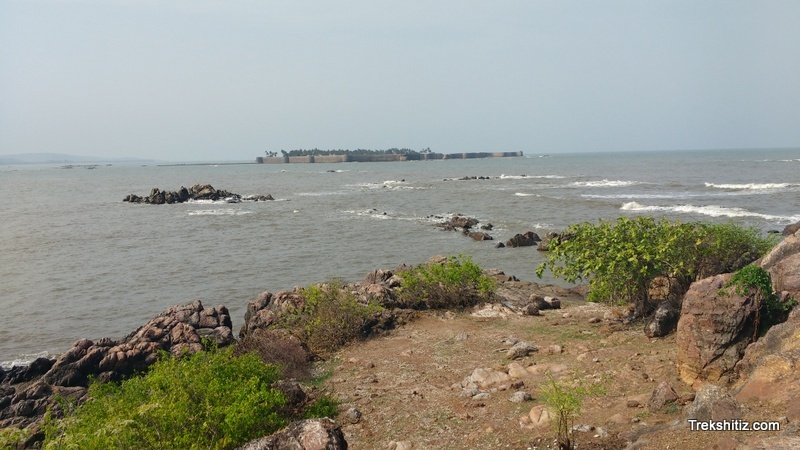 Rajkot was built on a natural elevation to the north of Malvan to protect this part. Shivaji Maharaj built this fort between 1664 and 1667. In 1766 there was a treaty between British and Chatrapati of Karveer, and the British wanted permission to set a ship-building yard in Rajkot. References say that there were some remnants and a canon on Rajkot in 1862. There is just one bastion on the fort. It is surrounded by land on three sides and sea on its one side. There is a flag host on this bastion for warning the boats due to rocky coast. In the adjoining rocky area a rock garden has been created, and we can see amazing waves playing with the rocks. On the way to Malvan from Rajkot, there is a temple of Ganesh where the idol is golden. There is a temple called Mauni Maharaj temple built by Shivaji Maharaj in Medha Rajkot.